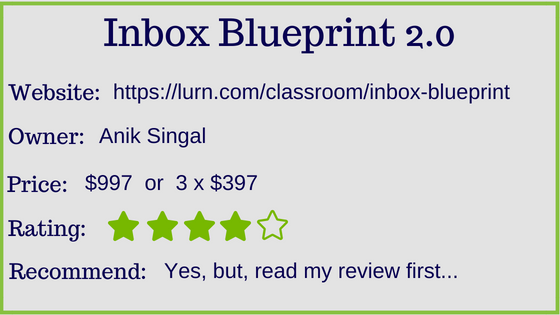 What Is The Inbox Blueprint 2.0? Why Are There No Negative Reviews? Are you needing to jack-up your email marketing? Or maybe you haven’t even started one yet? And you’re hearing people say the “money is in the list”, or “each subscriber to your list is worth $1 per month”. In today’s online marketing industry, email marketing is still the most lucrative and desired strategy. According to Statista.com, there were $3.7 billion global e-mail users as of 2017, and likely to remain one of the main marketing channels. In the USA alone, half of the marketers intend to raise their email spending budgets from $270 million in 2015 to $350 million in 2019. That’s a lot of “millions”. Don’t you think it’s time to join the bandwagon? OK, so now what? Where do you start? Have you heard of Anik Singal? He just upgraded his previous email marketing course to 2.0, which includes automated software. But you’re wondering what IS the Inbox Blueprint, to begin with? Is it worth the price of admission? Why are there no Inbox Blueprint negative reviews? 1 What is the Inbox Blueprint 2.0? 2 Who Is This Course Designed For? 3 How Does This Program Work? Inbox Blueprint 2.0 is an email marketing course with automated software. It teaches you why email marketing is important and shows you how to build your own email-based business from scratch, using their point and click program. Anik Singal (creator of IB and CEO of LurnNation) has 15 years experience in online marketing and teaches over 350,000 students around the world. His specialties are product launches, funnel building, SEO, content marketing, affiliate marketing, and business management consulting. Needless to say, he knows his stuff. Inbox Blueprint 1.0 was first launched in January 2014. Anik launched it a second time in 2016. Though a successful product, Anik decided to create a new “click” automated software that automatically creates your opt-in pages (this is where you offer something in return for an email address). It also delivers thank you pages, emails for your autoresponder, and lead magnets, all in one place, to run your campaign. He named it “LaunchPad”, and relaunched Inbox Blueprint 2.0 in March 2018. Wow, really?! With a few clicks of the button, this software does everything for you? That’s impressive in itself! Anik believes there are only five steps to answer your income problem. And this is what you will learn inside this course. The courses are basically the same as before, but with updated videos, webinars, and training sessions. a one-time payment of $997 (an almost 20% discount). This platform is for someone who wants to grow their business and create an automatic way to create income. It’s not a get-rich-quick method and requires work to achieve success. Even though they say they’ve designed the course for beginners in digital marketing, I believe it’s geared more for people who have a basic understanding of online marketing techniques. Be prepared to hear a lot of marketing terminology, that may not necessarily be explained. This could slow down your progress as you try to understand what they’re talking about, but with some research, could be overcome simply enough. The ideal candidate would already have an online business with the desire to build an email marketing campaign or start additional businesses with email marketing alone. There are no guarantees that you will succeed with the Inbox Blueprint program. But then again, there are no guarantees with anything in life, except death and taxes, lol. But, if you invest the time, do the work, follow the blueprint, and attend all the training and webinars, you will see positive results. Anik believes that if you start at the beginning and take a roadmap through to the end, that you can be successful. Which is true of any online business. Learn by going step by step, and take consistent action. The Blueprint layout is a structured, step by step course, broken down into eight modules. It contains video tutorials, PDF’s, worksheets, and of course, access to the Launchpad software. Upon purchase, you will login to the member’s area and watch welcome videos by Anik Singal (the creator), Jeremy Bellotti (the Lurn transformation coach) and Dave Lovelace (the Lurn Team Director of Education). As of this writing, there are 4 videos taking approximately 1 hour to watch all. An excellent way to learn what the training is about and how to navigate the dashboard. This intro will give you the “long view” of the course and why you need to build a solid foundation. It teaches you what email marketing is, and how building funnels can generate a passive income. You will also be introduced to some coaches who will be helping you. (Not all the videos are by Anik himself). In this first module, you will learn what a niche is, and why picking the wrong niche, to build a list and market products to, is a recipe for failure. You will learn how to pick the most profitable niches, that pay out the highest commissions, by doing proper research. The exercises will help you learn how to pick your “hot” niche, through research with YouTube, Google, Amazon, ClickBank, and Magazines.com. You will then be directed to sites like ClickBank to select your product to promote, as well as be introduced to several other money making methods such as CPA (cost per action) or CPL (cost per lead). You then activate LaunchPad with your choice from 32 niches (continually updated). Choose between a Quiz funnel or a classic Squeeze Page funnel. Now its time to create your “bait”. This is the free “something” of value (bribe) you offer in exchange for someone’s email. It’s your opt-in page. This can make or break your campaign, so you need to learn the anatomy of a successful page. Things like the page design, copyrighting, when to use a single vs a double opt-in, what data to collect, and creating a high converting PDF gift. Using LaunchPad, you can choose from over 4000-page combinations. Just point and click. This is one of the most important areas that email marketers ignore or forget. The thank you page is the step that builds trust with your audience. You’ll learn the secret behind it and how to structure it correctly. Once it’s written out, you’ll learn how to apply it on ClickBank. This page itself can start earning you revenue as soon as you get subscribers. They will help you choose a great TYP offer and show you how much you could actually earn with this page. Anik will also discuss a transitional page, which is optional to use. Your exercise will be to choose your offer and design your page. Choose between a Segway page (to help pre-sell your lead before sending them to your affiliate link) or a Timer page which has timer count-down. Module four is all about autoresponders and how they automate your business. You’ll learn how to set them up, about tracking statistics, and the type of messages you can send (content, promotional, newsletters, etc). They will recommend several autoresponders like Aweber and GetResponse, but if you want to use Launchpad, you will have to subscribe to Sendlane. This is the one integrated into Launchpad. Your first month is free but then continues at a monthly cost to you. To create any type of income from your email list, you need to develop a relationship with and nurture your readers. This module teaches you how to engage with your readers so that they’ll want to read it. You’ll learn about providing quality content, subject lines, when to promote items and why, and how long to promote (10 days? 1 month?). Should you use low, mid, or high ticket items? And finally, how to avoid any spam filters and the promotions tab. This how-to module is probably one of the most important ones in the course. Learning to know your subscribers, what to write, and how to write to them, will make you much more money. Module six will show you additional strategies to create multiple streams of income. Whether it’s finding more affiliate programs, creating and promoting your own products or webinars, or promoting event-based marketing, you will learn how to monetize your list and sustain your business. Your exercise will be to pick offers you think your readers will enjoy, by adding bonuses or your own product. Without traffic, all your hard work is useless. This module shows you the different ways you can send traffic to your offer. Both free and paid. Anik’s free strategies include guest blogging, forum, and blog commenting, Twitter and Yahoo Answers. His paid strategies include Solo Ads, Facebook Ads, and Google Training. His recommendation is to use Solo Ads to accelerate your list. He will teach you how to negotiate with solo ad vendors, using his own techniques. Expect to pay an additional cost to acquire solo ads, and several hours per day performing traffic gaining strategies. Your exercise will be spending time acquiring both paid and free traffic using the recommended strategies. In this final module, you’ll get an overview of everything you’ve covered so far, and what metrics to watch. Anik will share with you his secret to increasing deliverability and open rates, getting better conversions, and what to do when things don’t work out. Over and above the 9-part course and the launchpad, Anik is offering you bonuses. Training, directly from Anik Singal, including live Q&A. Watch them build a business using the Inbox Blueprint model, right in front of you. The Inbox Blueprint 2.0 is a structured, step by step program that leads you by the hand through each module. Training provided in both video, and text. The Launchpad software literally does everything for you. A big time-saving feature. Can build up to 10 businesses with Launchpad. Access to 30 of the most profitable niches. Thousands of proprietary, unique articles continually being added. 12 months of unlimited support. Access to their community of students. The overall cost of using this program is high for a beginner in online marketing. It requires a significant investment before getting any ROI (return on investment). Launchpad has integrated Sendlane as the autoresponder. If you wish to use the Launchpad, you are required to use Sendlane. If you select a list you’re already using, the system will override your existing autoresponder. The cost of Sendlane could have a higher monthly cost than the one you’re currently using. The Launchpad templates are used over an over again, saturating the market with the same ads. This duplicate content could hurt your business. If you enter the program with no previous email list, the cost of solo ads can get expensive. Difficulties may arise without any online marketing experience. I believe the Inbox Blueprint 2.0 program can be very effective for persons wanting to build email marketing businesses, or grow their own existing business. Anik Singal himself uses these systems for his businesses. Though his desire is to make money as well, he seems genuinely motivated to teach you the best practices for email marketing. And this is why we don’t see negative reviews online. It’s a proven method that has worked for many people. That being said, I also believe that this program would be best used by people who already have some online marketing experience. There is a large learning curve for understanding all the techniques and terminology related to this industry, and I think someone coming in with no previous experience or knowledge, will find it difficult to keep up. To build a solid foundation for any online business, you need to learn from the ground up. Anik states he teaches you this, but only the ground up for email marketing. There are so many more facets to online marketing and many more methods of monetizing your business. Email marketing is only one method. If you already have experience but haven’t started your own email list, then this is certainly a great way to learn. Just be prepared to accept the concept “you need to spend money to make money!”. If not, this isn’t for you. If you’re a beginner to this industry, then I wholeheartedly advise you to get your feet wet first. Learning how to build a business from “idea” to “profit” is a vital first step. In which case I would recommend a wonderful platform, that you can join for free! You will learn how to build your online business from scratch, and apply your knowledge to create incomes from many methods, not just email marketing. It’s always important not to put all your eggs in one basket. Click on the picture below to read about my best recommendation. Do you have any online experience yet? Have you tried email marketing and just can’t make a go of it? Thought I would check out this review on email marketing and what I’ve learned was you have done a good review. The thing I see about this particular product is it’s not easy to do. Anything worth doing takes work. In this case, you need experience and like taking risks. That’s a lot a money to throw at a business not to know anything about email marketing. Hi Fred, and thanks for your kind words. Despite these type of systems saying it’s easy for beginners, it’s really not. Email marketing is a legitimate way to earn income, but it’s a costly process. You can learn how to do this with free traffic sources, but that takes a long time to build your email list. Most of these systems recommend you buy ads and solo ads (paying someone to deliver your ad to their list), which can become very expensive from the onset. So unless you have a generous advertising budget, it won’t work as well as they claim. I’m working on my blog but I have neglected e-mail marketing. It seems to me that it’s quite complicated to learn. But this software is really impressive. I think this course is good for me. Thanks for sharing. Glad to hear you’re working on a blog. I would suggest you don’t worry about email marketing until you’ve seen some successes with your blog. There’s a lot to learn, and you should go one step at a time. People who are impatient and start too many things at once, usually end up with nothing in the end. If you need any help with anything, just let me know. I suppose if you want to learn more about email marketing and you have money to blow, it might be worth it. However, that’s a hefty price tag just to learn email marketing. I’m sure it would work, though, as you’ve stated. From what I’ve seen, this kind of marketer constantly barrages his/her email subscribers with sales pitch after sales pitch. I subscribe to some on JVZoo and Warrior Forum and that’s ALL I get in my emails from them! I, personally don’t want to market that way myself, plus, like you said already, the templates are thoroughly saturated on the net! I like your alternative option better. They teach you how to market by helping your prospects, rather than sending them to sales funnel after sales funnel. They teach you every detail about setting up an affiliate marketing business AND you can even find a lot of training about email marketing on the platform FOR FREE! It’s a much wiser choice and I’m really glad I discovered it! Great post, again, Suzanne! Thanks for the info. Yes, that is the nature of email marketing. You pay someone (per click) to get a large email list right off the bat, then you have those addresses for future promotions. It’s not my style either, lol. The can get pretty frustrating. I want my readers to trust that I’ll give them valuable, helpful information first. Then hopefully, they’ll trust my recommendations, if I have any. I hope you’re enjoying WA as much as I am. Let me guess, Wealthy Affiliate is the free program 🙂 I definitely enjoyed reading your blog post. This does seem like an interesting program that you recommended; I’ll look into it in the future, but WA is first, always! Thank you very much for this Suzanne. Yup you got it, lol. I think you’re doing the right thing. Once you’ve gained all the knowledge you need to get a business up and running, for free, then you can consider the Inbox Blueprint later on. That way, is something happens to Anik’s product, you’ll still have your business to sustain you. Wow Suzanne,This information is really helpful not only for beginners but even advanced marketers who have not known the technicality of the Lurn Nation by Anik Singal. I’ve been to one of their webinars that charged me a dollar only. Now that you’ve given a detailed review of the site, I come to know that this truly is not meant for beginners with less marketing experience. You’ve also given the pros and cons which is an eye opener for everybody. Looking forward to reading such insightful reviews. Hi Phomrong, and thanks for visiting. Anik Singal is developing a nice platform with Lurn Nation, but yes, I do feel concerned about newbies, lol. That’s why I like to look at both pros and cons, to give people the chance to make an informed decision. I recommend people start at the beginning, and then when they’ve gained enough knowledge, paying for a product like Inbox Blueprint, won’t be so intimidating. The best scenario would be to use some of the earnings from your already successful business, and invest in Anik’s product to create another income stream. Oh, my, this is so tempting! I almost want to sign up for more information, except that I don’t have any experience with marketing online or with corresponding via professional emails. It is tempting isn’t it, lol. If it’s your desire to do strictly email marketing, then this product will certainly give you what you need. You just might get bogged down with the terminology. But if you’re good at research, and are patient, you should be fine. It’s a big price though, for getting into something you know nothing about. That’s why I recommend Wealthy Affiliate first. It’s free to join, and you can get that initial exposure to online marketing. It’s a win-win. I have been avoiding building an email list because I hate getting marketing emails. I’m sure I’ll invest in it in a few months or so, but right now I’m in the process of following the wealthy affiliate training to generate online SEO traffic. You’re doing the right thing! I’m glad your a WA member and learning from the ground up. It’s very important to learn the proper process of developing your website and getting some content up before tackling an email list. You have to have traffic before you can email them, lol. So don’t fret, you have lots of time. If you wait until you have a consistent amount of viewers each and every day, then you can start an email list. I you have any questions, please let me know. This was a very honest, throughout review of blueprint 2.0. You are right, I haven’t seen any negative reviews but I haven’t seen such an extensive review such as this. It does seem like a big investment, but in the long-run, they teach you everything you need to know to master email marketing. This is the key to making money online but it can be so complicated when you don’t know where to start. I think the best part is that you get a year of unlimited support and that you can contact Anik yourself and ask him questions if you don’t find what you are looking for in this training. I don’t have any email marketing software on my site because frankly, I don’t know how to go about it! But I am going to be checking this out for sure because this is the key to making thing work for me online. Thank you so much for this review. You covered everything! Hi Sophia and thanks for your kind words. I tried to be as thorough as I could. It’s important for me to show my readers what exactly they’re getting into, lol. Yes, this is a legitimate platform. Anik Singal has produced successful products in the past, and this is his newest one. The cost can certainly be prohibitive but if your of the mind “it takes money to make money”, then you’ll love this. Of course I still strongly recommend training like Wealthy Affiliate. They show you everything you need to learn from the beginning, including email marketing. It’s good to have this knowledge in case Anik’s product is ever taken off line. Then you’re stuck with nothing!